Strenuously bizarre, visually impressive and not entirely original, the Korean take on the Brothers Grimm classic tale is less a literal interpretation of the text and more a projection of what might happen if the titular siblings were to remain in the gingerbread house for decades after burning the old lady, with superpowers. There's some hullabaloo over neglected children and cyclic patterns of abuse, to pay homage to the intended subtext, but for the most part, it's evil rabbits, crazy evangelists, cannibalism and really bright colours. Our peregrination into this strange new world comes via Eun-Soo (Jeong-myeong Cheon), a damaged young man whose heavily stylized vehicular faux-pas, whilst chattering away to his very pregnant wife on a cell phone, leaves him unconscious in the woods. Upon awakening, the red-cloaked Young Hee (Sim Eun-kyeung) leads him to the "house for happy children," where an overly enthusiastic and colour coordinated family of five welcome him with creepy smiles and loads of confections. 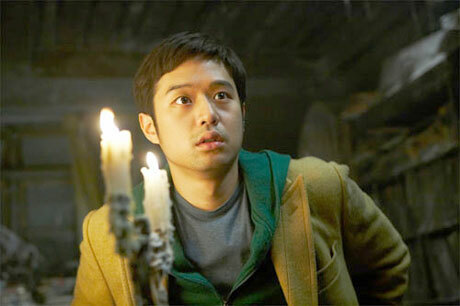 Soon after arriving, the parents go missing and Eun-Soo is left with the children, trapped, despite multiple attempts to find his way out through the maze-like woods. Enter some disturbing bunnies, a creepy deacon (Hee-soon Park) and some moving trees, and Eun-Soo's acid-laced odyssey goes from disturbing to downright didactic. While not amazing, Hansel & Gretel is definitely a decent film that should translate well to the horror crowd, or anyone intrigued by a somewhat sick version of a fairy tale. Production and sound design are the film's main achievements, as it's stunning to watch from beginning to end, despite using minimal CGI, but there is little to ponder beyond this polished surface.